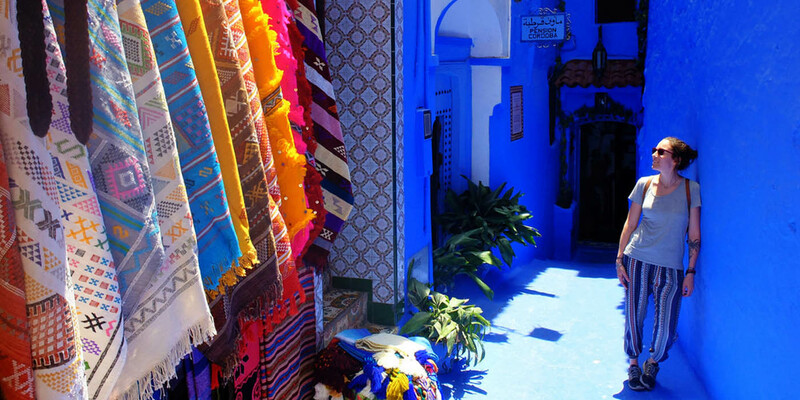 Meet at the port of Tarifa to Tangier city and head to Rabat the capital of Morocco. The city is located at the edge of the Atlantic in north-west of Morocco, the city was founded in 1150 by the Almohades, who built there a citadel (become the kasbah of Oudayas), a mosque and a residence. It was then called a ribat ("fortress" 10). The current name comes from Ribat Al Fath, "Victory Camp". Later, the grandson of Al-Mūmin - Ya'qub al-Mansūr - enlarged and completed the city, including surrounding walls. Subsequently, it served as a base for Almohad expeditions in Andalusia. Break in Casablanca to visit the Hassan II mosque. 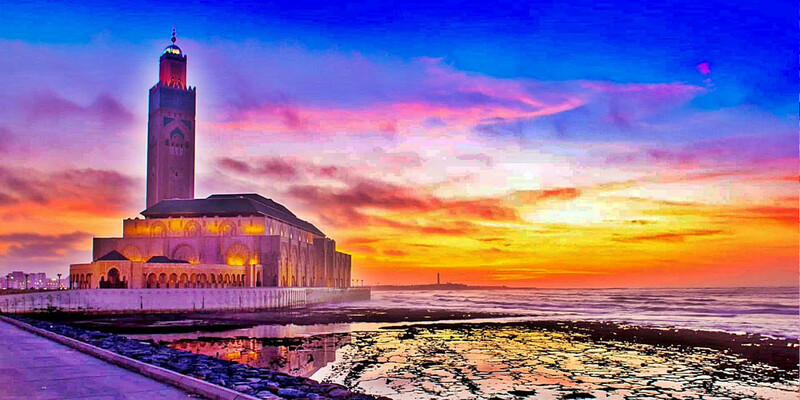 Hassan II Mosque (Masjid al-Hassan Ath-Thani) is a mosque located in Casablanca. Built partly on the sea, it is a religious and cultural complex, built on nine hectares and includes a prayer room, ablution room, baths, a Koranic school (madrasa), a library and a museum. Arrival in Marrakech, nicknamed the Red City is a city located in southern Morocco, inland, at the foot of the Atlas Mountains. The city was founded in 1071 by Youssef Ibn Tashfin As-Sanhaji, at the head of the Berber empire of the Almoravids. In the past, Morocco was known in the East as Marrakech); the name Morocco comes from the deformation of the Portuguese pronunciation of Marrakech Marrocos. 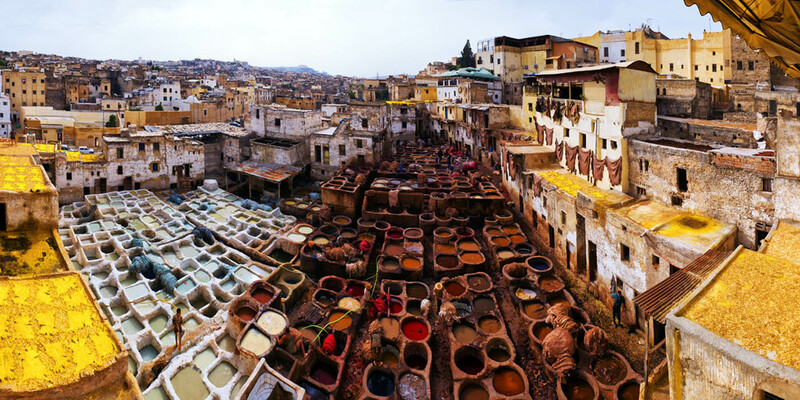 Arrival in Fez The city "Medina Fes" was founded by the sheriff Moulay Idris I in 789 on the site of the current district of Andalous. In 808, the regent Rashid Ben Morshid founded "al-Aliya" on the other side of the Oued de Fes. Al Aliya develops very quickly and becomes a real city with mosque, palace and kissariya (hall, market). As part of the imperial cities of Morocco, it was at several times the capital of the country and is considered today as its spiritual capital. Its foundation dates back to the end of the 8th century, during the reign of Moulay Idris I.
Meknes is a city in northern Morocco founded in the 11th century by the Almoravid dynasty. It is the former capital of the Meknès-Tafilalet administrative region and currently one of the two urban centers of the Fez-Meknes region in the north of the country. It is one of the four imperial cities of Morocco and the sixth largest city of the kingdom according to the 2014 census.2 It becomes the capital of Morocco during the reign of Ismaïl ben Chérif (1672-1727). The historic city of Meknes has been under the protection of UNESCO since 1996. All expenses not included in the program.